Step Three in the #TeamUp4ConcussionSafety game plan is a mandatory pre-season concussion safety meeting. Unlike the typical concussion safety meeting, which generally focuses on educating athletes about the signs and symptoms of concussion, and the dangers to an athlete’s health from continuing to play with concussion, the #TeamUp4ConcussionSafety™ concussion meeting focuses on changing attitudes about concussion symptom reporting by emphasizing the performance benefits of honest symptom reporting to the athlete and their team. maximizes the chances that the athlete, if diagnosed with a concussion, will miss the shortest amount of time as a result of the injury and returns to play as soon as reasonably possible. 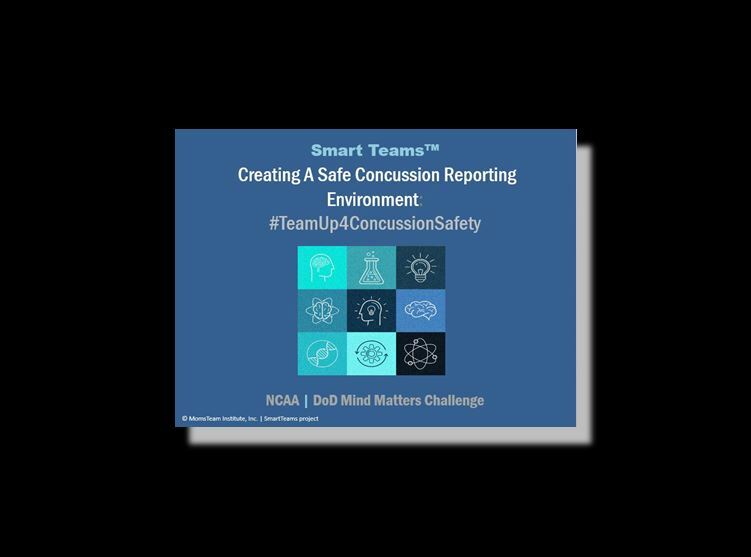 all stakeholders (coaches, the athletic training staff, and parents) begin to create a climate in which athletes feel comfortable reporting symptoms of a possible concussion. Reassure athletes that they will not jeopardize their position as a starter or place on the team if they self-report, and that he/she will not question their toughness, call them “wimps” or “sissies,” or ostracize them. SmartTeams believes that, by working together to create a safe reporting environment, and appealing pragmatically to the self-interest of coaches, athletes, and parents in achieving individual and team goals such as winning, we can create a culture of safety in sports because SmartTeams play safe! You can download a suggested PowerPoint presentation below.